When the weather turns chilly, one of my favorite breakfast foods is oatmeal! What’s not to like? It’s comforting, filling, and delicious. It’s also a versatile base for dressing up with a wide variety of flavorful ingredients. 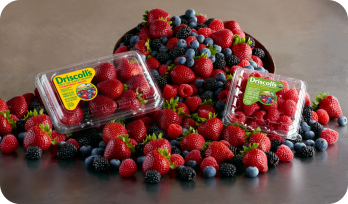 In honor of National Oatmeal Day on October 29th, my friends at Driscoll’s are highlighting how well their juicy berries pair with hearty oatmeal. Berries make a terrific oatmeal topping or ingredient. I paired their juicy organic strawberries with seasonal Gala apple to create a delicious Baked Strawberry-Apple Oatmeal. This recipe makes a fantastic weekend brunch. You could also make a batch on Sunday evening and store it tightly covered in the fridge for convenient on-the-go weekday breakfasts. It’s moist and lightly sweet – so we also enjoy it warm from the oven as a dessert. Not only do oatmeal and berries taste great…they’re packed with health benefits too! Oatmeal contains significant amounts of beneficial protein and fiber, which help you to stay feeling full longer. Berries are low in calories and high in fiber and Vitamin C. In fact, one serving of strawberries may help improve heart health, lower blood pressure, and lower the risk for some cancers. Delicious and healthy is combination we can all get behind! This Baked Strawberry-Apple Oatmeal is sweetened with maple syrup and a touch of brown sugar, and it bakes up moist with a soufflé-like texture. Step 1: Preheat oven to 375. Butter the top and sides of a 9x9 square baking pan or 4 large ramekins. Set aside. Add the oatmeal, pecans, salt, baking soda, apple pie spice, strawberries, and apple to a large mixing bowl. Use a spatula to carefully combine all of the dry ingredients. Step 2: Add the Greek yogurt, almond milk, eggs, maple syrup, brown sugar, and vanilla to a bowl or 4-cup measuring cup. Whisk well until the eggs and brown sugar are completely incorporated. Pour the wet ingredients into the bowl of dry ingredients and stir well to completely combine. Step 3: Pour the oatmeal mixture into the prepared pan or ramekins. Place the pan or ramekins on a rimmed baking sheet. Cook until the top of the oatmeal is browned and the mixture is set – approximately 45 minutes. Turn the pan around halfway through the cooking time to ensure even baking. Remove the baked oatmeal from the oven and let cool 5 minutes before serving. Serve with a halved strawberry on the top of each serving, along with additional maple syrup for drizzling on top. I loved this moist and fruity oatmeal! Each bite is bursting with the flavor of strawberries and apple, and the sweetened custard keeps the oatmeal moist and lightly sweet. The nuttiness of the chopped pecans works really nicely with the oatmeal too. This is a decadent breakfast you don't have to feel guilty about -- whether you serve it in squares from a pan or in individual ramekins. I hope that you’ll make a batch of this delicious fruity baked oatmeal to celebrate National Oatmeal Day on October 29th! Disclosure: Driscoll's provided me with berry coupons and a Whole Foods gift card to facilitate this feature. I received no further compensation, and all opinions expressed are solely mine.